Ford is marking the 50th anniversary of the Transit van with a Press event at its Dunton, Essex, European Research and Development Centre. The Transit is no longer produced in Britain, the Southampton plant being the last Ford UK plant to produce it. 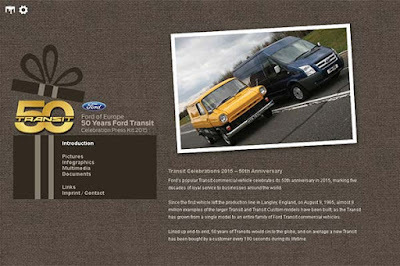 Even so, the vehicle has grown from a single model to an entire family of Ford Transit commercial vehicles. Lined up end-to-end, 50 years of Transits would circle the globe, and on average a new Transit has been bought by a customer every 180s during its lifetime. The original post war Eurlopean van, the Taunus, was launched in Germany. Unusual for its day it had front wheel drive. When the Transit first appeared it had, of course, rear wheel drive. Today, Transit vans for Europe and North America are engineered at Dunton, UK, according to Ford sources. Interestingly, it was the arrival of Mercedes-Benz's Sprinter van in North America which set the cat among the pigeons. This set the benchmark as it opened the eyes of operators in the region to a new world of vans, causing Ford to respond with its Transit which has become for Ford a 'world' van.